Well I guess any blog about Cape York would not be complete without a story about our trip to the Northernmost Point of the Australian Continent. We set out from Loyalty beach and took the back road (dirt tracks) up through small creek crossings and the beautiful Lockerbie Scrub to the Croc Tent. The Croc Tent is a unique souvenir shop situated at the junction of the Punsand Bay and Cape York roads. It sells absolutely everything you could possibly want as a souvenir of your trip to the top. We stopped in to pick up some t-shirts, stubby coolers and other assorted paraphernalia to prove we had been there. Now Linda, who is a shopaholic, had a field day in there, we had been without any shops or stores for about a week now, so she was intent on getting her fix! When we had finally managed to drag her away we continued on the Pajinka road on the way to the Tip. Pajinka, is the Aboriginal name for the land at The Tip, the lands traditional owners are the people of Injinoo. On the road in we saw the ruins of the old Pajinka Wilderness Lodge. 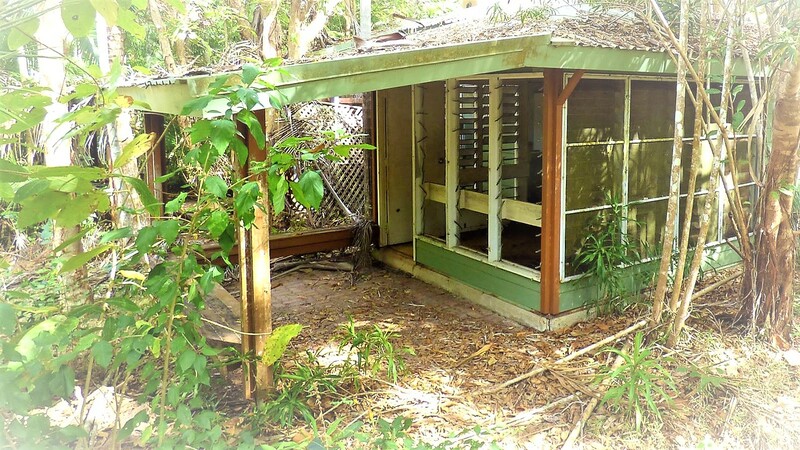 This was originally opened as a five star resort for pilots in 1986 (called the Cape York wilderness Lodge) and had several owners throughout the years. It was sold to the Injinoo Aboriginal Cooperation in 1992 and renamed the Pajinka Wilderness Lodge. 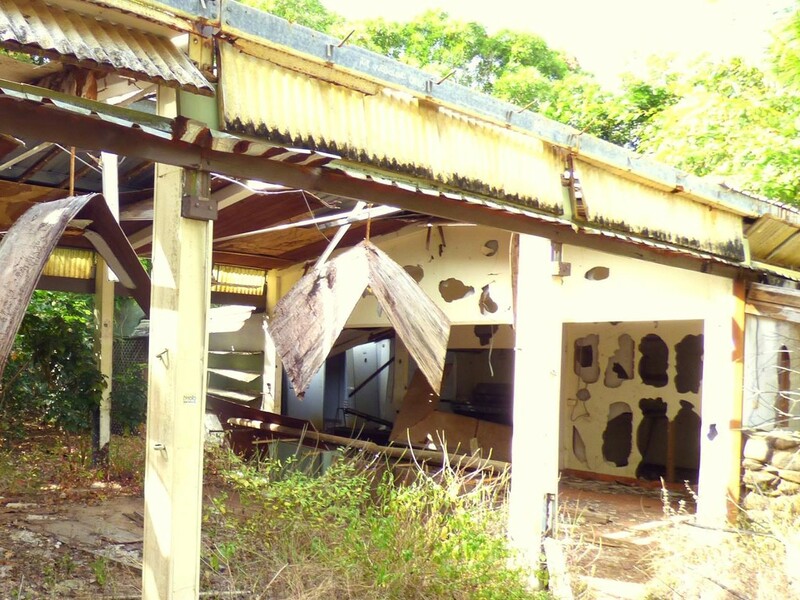 It closed in 2002 never to be opened again and now is a curiosity of derelict infrastructure in the middle of nowhere, rapidly being overtaken by tropical rainforest. We arrived at the car park for the short walk to the tip. It was then that we found out we had a short walk over the headland to get to the tip itself. Now it is worth mentioning that we got there quite early. We did not really want to spend time queuing to get our photo taken so we thought we would try and beat the hoards and coach loads by arriving early. As we started the small climb over the headland. The view from the peak was amazing, looking out over the pristine waters of the Arafura sea to the York and Eborac Islands. At the top of the climb, before you start the descent to the tip, there is a monument that makes you realise just how far away you are from the rest of Australia. On this disc are the distances for places around the world and it makes you stop and think that at this moment you are closer to Papa New Guinea (Daru, 190km and Port Moresby, 320km) than Cairns (770km) or Brisbane (2120km). Just wow! It was about this time that we realised one member of our party (Linda) was carrying her very large handbag with her. Hmm, bit of a strange item to lug all the way to the tip (unless of course it is filled with beer). This was the stage that we found out something very unique about Linda. We always knew she liked to wear branded clothes and put great store in the finer things in life (well why wouldn’t you). We were unsure however when she would be wearing her diamonds and pearls on a trip to the Cape. You see the reason she had brought her handbag with her on the trek was because it contained (yes you have guessed it) her jewelry. Instead of leaving these items at home in her safe in her alarmed house she had felt safer bringing her expensive jewelry with her! Unfortunately for Linda we did have a good giggle about this for the next two weeks (and longer). Once down the other side we did the obligatory photos and beer at the tip. We were very lucky to have the area to ourselves for quite a while so many happy snaps were taken whilst sipping beer and marveling at the sights. We thought Easter would be the ideal time to do a good shake out of our new 79 series cruiser and getaway for a long weekend of camping. We decided to travel up to the Palmerston (Doongan) Wooroonooran National Park, just inland from Innisfail, off the Palmerston Highway. Now at this time of year in the tropics the weather can be pretty much hit and miss. It was very damp (as a rainforest is intended to be) but we are pozzies and as such are used to camping in damp and wet conditions! We pulled up at the camping area at Henrietta Creek and found that a car had been left at the entrance to our camping spot. Undeterred we pulled in and got stuck into the task of setting up. We had bought our trusted Oztent and after I had got up on the top of the cruiser to retrieve it we set it up under some beautiful trees. We also set up the shower tent, although the camping area did have toilets it had no shower and we wished to test out our new hottap outing setup (which was very welcome on the Saturday). Whilst enjoying a glass of wine the owners of the car turned up with some friends. Now I am not one to judge but they were definitely trying to pull a “swifty” and camp without paying for a permit. They tried to tell us that they thought that was the campsite they had booked and when I asked to see their booking/permit they said they did not have it. Once I had informed them that NP’s require you to display your permit they then tried to tell me they had paid at the honest box. Honestly, there is no honesty box, so once they realised that I knew what I was talking about they swiftly left. I do not understand some people as the campsite is only $6.55 pp per night, a small price to pay for such a beautiful setting with amenities! No sooner had we seen these people off, we had another visitor to our campsite. A beautiful Cassowary wandered through, completely unperturbed by us. We then settled down to enjoy dinner and a good bottle of wine. That was when I found out about leeches. The area was very damp, and I was wearing the good old Aussie thongs. I looked at my foot and saw a blob of what I thought was mud stuck to my toe. I tried to wipe it off and then squealed, yuk!!!! It was a leech which I promptly removed (it came off easy enough with a bit of a pull). Then Mike got bit by an ant, and he cried out. Now it is unlike him to make a fuss, but he said it was extremely painful. Well no wonder it was painful it turned out to be a bull-ant (they inject formic acid!). So now that we were really in touch with nature we both put on enclosed shoes and finished our dinner and wine. In the morning we decided to go for a walk up to Nandroya falls. The rain had stopped, and we thought we could do with the exercise. We set off armed with good walking shoes, water and camera. Now the walk is a circuit that starts just west of the camping area. The left-hand fork takes you up though the rainforest with a couple of creek crossings and across Silver falls to Nandroya. The track was slippery and wet and a bit rough in places due to the rains that had happened in the weeks before. The scenery was beautiful, and the creeks were running very well. It did start to drizzle again on our way up, but it didn’t bother us too much as we were mainly covered by the canopy of the rainforest. We had to remove our shoes to cross at Silver falls, and I thoroughly checked for leaches before putting them back on! We eventually reached Nandroya falls and it was amazing. Due to the rains it was running full and what a sight it was. Such a beautiful area, but very wet!!!! It was definitely not swimming weather, but we did get some fantastic photos before we got too wet. We decided to head back down and passed a couple of other people coming up to the falls, the only people we had seen on the track. There was a sign on the track saying, “alternate route 4km’s” and we thought, why not. We could do with the extra km’s to burn off the wine the night before! Now remember I had told you the area had had quite a bit of rain in the weeks leading up to Easter? Well this track was a bit washed out, but we kept going thinking, “it can’t be that bad or they would have closed it”. In the immortal words of the young today “Yeah, Nah”! We came across our first obstacle, a fallen tree, but we managed to navigate it very well, avoiding some stinging trees in the process. Stinging trees have attractive heart shaped leaves but believe me you do not want to brush up against them. The hollow silica-tipped hairs can cause extreme pain lasting months. So, feeling quite pleased with ourselves we continued on down the track. That’s when we came to a big tree that had fallen across the path. We could not get over it, so we had to manoeuvre around it, which meant climbing down the side of the hill and walking around and then climbing up again! Now, we are no spring chickens (and maybe a little bit unfit), but we managed the climb carefully, getting to the other side a bit muddy but relatively unscathed. Now, from this point on you will notice I do not have too many photographs as we were concentrating on getting to the end of the track alive. We carried on, feeling a bit worried about the state of the track ahead but knowing we could not go back. We came to another obstacle and Mike had to “wait-a-while”. For those that do not know the wait-a-whiles are vines that hang down in the rain forest with hooked barbs on them that attach themselves to you and you have to stop and extract yourself from their grasp. Once he was extracted he went to walk off and flung a wait-a-while up which caught into my bare ankle. Ouch!!!!!!! I think I screamed (it really hurt as it dug in) and then was immediately worried that others on the track may of thought that something terrible had happened (if they did hear they did not come to investigate, hmm!) So, once we were extracted again we continued on a bit scraped and bloodied. We rounded a corner and my fearless husband (who was in front) tried to warn me that the path narrowed and was very slippery. Wham! He went down and all I could think of was grabbing him before he toppled over the edge and down the ravine to the Douglas river below. As I grabbed him I braced myself against the side of the cliff and dug in. He was a dead weight hanging there (I won’t say how much of a weight) as he scrambled to get his feet underneath him. Eventually he did get a ledge to put his feet on and scrambled back up to lots of hugs from me and not a small amount of hysterical laughter. That was when we noticed he had cut his leg. Now it was not too deep, but it was bleeding. The problem there was that he is on blood thinners and does not clot very well. Not a great position to be in, especially without phone signal. Anyhow we did continue on, with me checking on Mikes blood loss every 100 yards, and eventually got back to the beginning of the path. As we got to the fork, we saw some tourists coming up to start the trek. We stopped and told them not to go the long way as it was hazardous. This was done with a lot of hand gesturing and slow talking as they were German tourists. It was then that I looked down and saw that two of the lads had good old Aussie thongs on! I tried to tell them that they were definitely not suitable footwear for the track ahead, but I think it was lost in translation and off they went very happy! I never did find out if they made it back alive. We got back to camp and had a hot shower (the hottap was a godsend), then rewarded ourselves with beer and cheese all the while laughing about our adventure and how we didn’t do too bad for a couple of old pozzies! Due to another big rain event being predicted for the early hours of Monday morning and the fact that we had more than enough adventures for one weekend, we packed up Sunday afternoon and drove home a day early. The Cassowary put in another appearance before we left, and I got a few more photos. Even though we were late getting home that night, we were very glad to get home safe and sound without anything more than a few scratches and bruises and as usual one very good camp fire story.